To begin this I would first like to send my love and light to each one of you, to all my family, friends and kindred spirits who are forever in my life and in my heart. It may often seem we hardly see each other at times, if even at all, but for some reason we do stay connected and are connected. As you know, the last 2 1/2 years my life, with my 2 daughters Lexi and Eve, have seen many changes and much evolution. For each one of us, together and apart, and that’s what I am going to sit down and tell you all about, right now. What we’ve been up to, what’s happened, where we are now and where we are hoping to go! Most of you all know that I sold the Magellan Inn in July 2016. The beautiful little hotel that my mother Elizabeth and her husband Jean Paul had built and created, a little paradise, that I was blessed with inheriting and am forever grateful to both of them. It supported my daughters and I for several years, but it was time to move on and create something myself. I had a dream, oh yes I had a dream! The dream was a little more complicated than I had anticipated, but then most things are in life, aren’t they? The dream, at times seemed more like a nightmare, but it has turned into something beautiful that has realized itself in many different ways. My dream had 3 main ingredients, to begin with. Of course you all know this one for sure! If you know me, then you know this. I love horses! If you don’t know this, then maybe we need to talk? Since I could walk and talk, I wanted a horse. So of course my dream had to do with horses! I've had horses since I was 6, then went on a forced break when my parents decided to rid our lives of all the unnecessary material elements, including my horses and go sail on a boat. That was not my dream, but theirs, and I lived their dream for many many years. Grant you I had pretty amazing experiences, and do not regret any of it now. Traveling, learning languages, living with a variety of different types of people have also helped me grow into whom I am now. When I was little I used to crush berries and leaves, pretending I was a Native American healer, healing my friend's banged up knees and believing I could fix everybody (I have since realized I can’t and it is not my job, and that's okay). I have studied many holistic natural healing methods, for 3 years I studied Metaphysical Energy and was certified as a Metaphysical Energy Healer. Healing was big part of this dream. Yoga! I began my own practice on and off from the age of 20. When I moved to Costa Rica I met a wonderful lady, Joe. A Buddhist, an accomplished artist and a Yoga teacher. She had a wide open air terrace on stilts overlooking the Caribbean Sea, surrounded by coconut trees. There I began a deeper practice of yoga and meditation. Yoga, meditation, Joe and my horses, saved and healed me throughout the many difficult trials of life I had going on back then. That's a whole other story, no need to go there now. But I will say this, though they were hard experiences , I did grow from them, they are part of me and formed me, pushed me and guided me to where I am today. So I am grateful in many ways even for the rough crappy times that life deals out. Then, a beautiful soul, an accomplished Yogi came into my life and became my teacher, I then became a certified Yoga teacher myself! So, my dream was this, combining the 3 things I loved most (after my daughters of course!) horses, healing and Yoga, I created together with the help of Lexi and Eve, the Kindred Spirits Holistic Wellness Center. Now, don’t go and visualize some fancy Spa, because that is not what it is , nor what I am about, nor the dream. The dream, Kindred Spirits, is an organic eco-farm, a place where kindred spirits come together to share, to learn, to heal and to just Be, living in the moment. In Yogic terms, a place to begin the path of Self Realization. And so it began. We sold the hotel and we needed a new home. Fast! The new owners wanted us out and we had nowhere to go! Our search began, high and low, up in the mountains, down by the sea, there was no property that fitted our needs. We needed a big piece of land, enough for 8-10 horses, stables and an arena. We wanted land to grow. Peace and quiet, yet not too far away that we couldn’t ride horses to the beach and be totally in the boondocks far from everything. We wanted some sense of neighbors not too far away. Then of course, the price. We couldn’t find anything that could work for us and were close to giving up, when out of nowhere it came to me. I recalled having seen some house and farm that had been on the market for awhile, months ago. So off we went to search for it, and yes, that was it! We all knew it from the moment we put our feet on the land, we knew where the horses would go, where the yoga shala would be built, it was all there, snuggled in the mountains and only 2 km. from the most gorgeous Caribbean beaches, EVER! Yes, I said EVER. Plus it already had a house (needed lots of work and a full re-model, but the foundations were perfect) plus it had a little wooden house perfect for volunteers and - the price was perfect! A home, a farm and a Holistic Healing center. So we had the material for the dream and the hard, hard, very hard work began. We knew absolutely nothing about building, construction, organic farm growing, trees….. Nothing! Now I can say, we know quite a lot! Even Lexi, the computer/anime/tv/music geek knows more about plants and trees than most. We built fences, dug steps into the mountain, learned the do’s and don’t about building an arena (that was quite a nightmare, by the way) roofing, insulation and oh the worst, plaster. Plaster, plaster everywhere after sanding, every darn nook and cranny. Took us 4 full days to clean it up in time for Christmas. So many times I was overwhelmed and often depressed. What #$%@*& was I thinking of?! Why didn’t I just buy a tiny house, write a book, paint and give yoga classes and call it a day! Which actually I just might do one day, but that will be my retirement. I was too young to be retired at 53, plus I needed some more experiences to fill my book. Lexi often kicked and pushed me on, she believed in me and my dream and she did so much to help make it happen. Speaking of which or whom. Lexi. Lexi had been working in San Jose, after graduating from University in Graphic Arts and publicity. She was working for one of the big International advertising companies. She had even won first prize for Costa Rica in a Graphic design competition and went on to Cannes, in France for the finale, its a big International competition that takes place once a year in Cannes. Guess who was so proud she could burst? Yep, me! However life in advertising, she soon found out, was not her dream. She needed to heal and find her real Self, so she came home, which was still the Magellan Inn at the time. Now I had had the hotel up for sale for a while, there were 2 almost sales, a few bites, but nothing. Lexi comes home, decides "yes its time to sell", tells me it will be sold this year, 2016. Her power of manifestation when she puts her heart and soul in it, is like magic! The hotel was sold, just a few months after she came home! So here we were at the beginning of a big project and 4 hectares of almost virgin land with 2 houses. Eve had 1 1/2 years left of high school, Lexi was back home and we had lots of work. I spent most days in my car (oh yes we got a car, first car in over 10 years, a lovely Nissan Pathfinder we named….? wait for it, yes, that's right, Spirit! He’s a boy by the way, we figured we needed some male energy to help us out) going back and forth to the big hardware stores, ordering cement and heavens knows what else! It was my second home, everyone knew me by name and of course loved my daughters. Strange thing, every time I went with my daughters, we got served ever so much faster and better. I wonder why? When I discovered this, I’d trick my daughters into coming with me (they hate the hardware store) to get better service, worked like a charm. Lexi had several future husband opportunities in that store. I can still hear the sound of big giant trees crashing to the ground, the land trembling and reverberating . It made our hearts sad, to see these majestic trees fall , knowing that they were home to many other animals and plants. But we only chose the ones that had a rotten core and could fall on one of our houses, in other words, were dangerous not just for our homes but also for the other surrounding trees. We built the Yoga Shala out of a 300 year old Nispero (an extremely hard tropical wood) We did feel very sad in our hearts when this noble tree was felled. We had a ceremony of gratitude and planted a new baby Nispero in its place. This old Nispero lives on as our Yoga shala, energy transformed. It is a beautiful spot, peaceful and the energy is all encompassing. Our main house, the Lodge, was rather dark and dingy when we bought it. So we remodeled, painted, built on, added on and transformed it into a wide open living area overlooking the jungle, the trees, the mountain, the parrots and butterflies. Lexi and I spent a lot of time driving around in the car looking for plants, trees, fruit trees to fill our land. Thing is it’s a very big piece of land, so no matter how much we bought, it just disappeared in the jungle! Thankfully now it has all grown in the last 2 years and we can begin to see what we planted! And what I paid for! During all this building, construction, planting, creating, chopping and clearing, we were also doing Retreats and treks off and on. Life was busy, stressful scary, risky, money just flew out the door, but we kept moving forward. I mean by this point we really had no choice, keep going or sink! But we didn’t sink. Volunteers came and went. Bringing much needed help, a lot of fun, activity, sharing, learning, laughing and even sometimes crying. I love each and everyone of you who came, shared your lives with ours, joined us to create something even better and more meaningful. You have all touched my heart and I know this to be true, my daughters hearts too. We’ve helped each other and learnt so much together. You all know who you are so thank you with all my heart, you are forever a part of Kindred Spirits! One YTT was during the foaling of little Mashal. Born from his mother Shad, a white Arabian mare and Nahar a dapple brown grey Andalusian. We all waited each day each night for his birth, only to have Shad foal him while we were eating dinner! Sneaky Shad wanted her peace away from our hovering eyes. Then we had the naming ceremony at night. With a few chosen names, each student thought and spoke what their favorite name was and why, and so Mashal was named “the guiding light, to light our way” He is such a cute and kind of owns the place now! I think I can say that each of you felt something special at his birth , life is always a miracle. 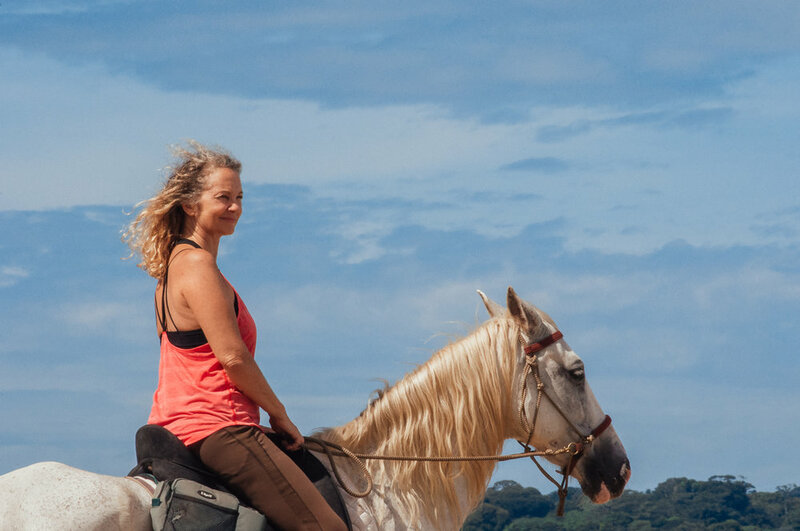 Guests have come for our horse treks and Yoga in Harmony with Horses retreats. For me, it has been such a different experience from the hotel. Now I get to know people, kindred spirits, who stay with us for a week or two. Sharing their lives. As a teacher and sometimes guide, I have given little pushes and nudges to people asking and searching. But mainly it has been the horses who have been the healers, opening doors to let emotions out, helping people to release and let go and truly see themselves as they are, without judgment. Horses, the mirror to our hearts. I have been blessed to be witness to such tears of joy and release from people opening their hearts with the help of the horses. Mothers and daughters reconnecting with each other, reconnecting with their true Selves. These last years have been such a rewarding process in my life , to be able to make a difference. However small, is like the ripple on a pond, as it reverberates outwards, spreading a little more compassion and light out towards the world. The horses embraced the new change and new farm with its pastures with relish and ease. A few left us, and I will never ever forget them, they are molded into my heart forever, for everything they taught me, for allowing me to be their protector, their friend, there are no words. Life does go on and so do they. Meditating, Sharing Sacred Space living with the horses as part of the herd is a big part of the activities here on the farm. Taking the time to just Being, present in the moment and always aware, just as a horse naturally lives and survives all the time., heals and brings peace to our hearts. I spend my time just Being with the horses, meditating, playing with them at liberty, running around and dancing together, creating deeper connections, learning to play with our subtle energies to connect and influence the horse where the horse keeps their free. Giving yoga classes in the early mornings to the neighbours, volunteers and guests, planting food to eat and medicinal plants to heal, having retreats and Yoga Teacher Training Courses, keeps me alive and moving. I learn everyday, I love the process of learning and discovery. When I was younger I learned through traveling outwards and now I spend more time traveling inwards, a never ending experience. The farm, the construction, the learning process, the hard work, has not been easy and many times I feared we would fail. My daughters and the horses kept me going, as well as seeing the difference yoga and horses have brought to the kindred spirits that find their way to our gates. Now things have settled, though on a farm there is always work to do, things to chop, to plant and to harvest, fences to repair, horses, animals and people to be fed, healed and cared for. But it is a sharing, we give and we receive , a process of compassion and understanding without judgment. Of course, there are schedules, routines to be respected, the yoga niyama “tapas” ( self- discipline) is very integrated in our farm and life as a horse lover and yogi. But it is done with respect to each other and with unconditional love, always love. This last year has also brought us a big advance in our Cahuita Turtle Rescue Association, something I founded with my friend Leda, a few years back when still living in the hotel in Cahuita. Many struggles, formalities, paper work and looking for funds. But bit by bit it has come together, and 2019 brings u into the action of building the first vireo to protect the eggs of the giant Leatherback turtle from being poached. A lot of time was just spent painting landmarks on the beaches, cleaning beaches, planting coconut trees to stop the erosion of the beaches (the turtles nesting grounds), lots of meetings, talking, creating and getting the word out through stands in different town festivities. Neighbours, volunteers, anyone and everyone who desired to help, were more than welcome and contributed to all that has been accomplished. If any of you out there are interested in helping or donating to this very important project of the giant Leatherback turtles (top on the endangered species list of extinction, please contact me!) We will soon have a link on our web site to how you can make a difference with just a little help. 2018 ends today and a new year begins. I always find this exciting and inspiring. Its like beginning with a clean page again “tabla rasa” (clean slate) Not that I am ending everything and starting a new, but more, as I learn to live more in the present and what it brings, making my choices in the present moment, frees me from fear of the future and now I look forward to what it brings! May the light and love follow you, inspire you and guide you my dear family, and friends. I wish to all kindred spirits of the Earth, a bright New Year full of joy, peace, adventure and discovery within and without!